Education | Nicholas Hoffman & Co. It is a feature of the human condition that we look for simple fixes to complex solutions. The good news is that this search drives innovators to develop ever more imaginative ways to make our lives easier. The bad news is that we tend to ignore solutions that involve disciplined changes in our behavior. There is probably no better example of the latter effect than the search for the elixir of youth. Does any reasonably informed American really not know the basic behaviors needed to improve their chances of a longer and healthier life? Just in case the answer to that question was no, Harvard popped up last week with the not so startling identification of five lifestyle changes which could add years to our lives. Even if you did not see this story, you could likely guess what these factors are: eat healthily, do not smoke, exercise regularly, stay trim, and drink in moderation. Taken together, these five factors can apparently add 10 years or more to average life expectancy – the study showed the potential impact on a person aged 50 was an additional 14.1 years for a woman and 12.1 years for a man. That is a long time – and long enough to stay around to see a whole new generation grow up. The obvious question is why do we not do the obvious when it comes to the central driving force behind the success of our species? The answer is well beyond my limited understanding of psychology, but I believe that a lot of the explanation can be found in our preference for immediate gratification versus some less certain benefit down the road. I am also fairly sure that a similar problem exists in the area of personal finance. We do not have a Harvard study of 100,000 people to confirm the basic behavioral rules that lead to financial well-being, but there are plenty of other studies out there that give some strong clues. My favorite list of five is simple: be clear about what financial comfort means to you (“financial objectives”), develop a credible plan, think long term, live within your means, and understand risk (which will generally lead to diversifying any savings and investments). I could add more, like avoid placing large bets on the Derby or being sucked into Bitcoin mania, but that might lead to accusations of personal bias. You might have a slightly different list of five but I expect it will be somewhat similar. Just like the lifestyle factors, the behaviors needed to improve financial health are within the scope of most everyone. In fact, there is a strong argument that, in a society based on individual responsibility and a market economy, we should all be well versed in financial management. Whatever the merits of that case there is no prospect that our leaders will provide the education. It is up to us to make sure we are aware and knowledgeable, and up to us to help our children learn the basic behaviors that lead to financial security. 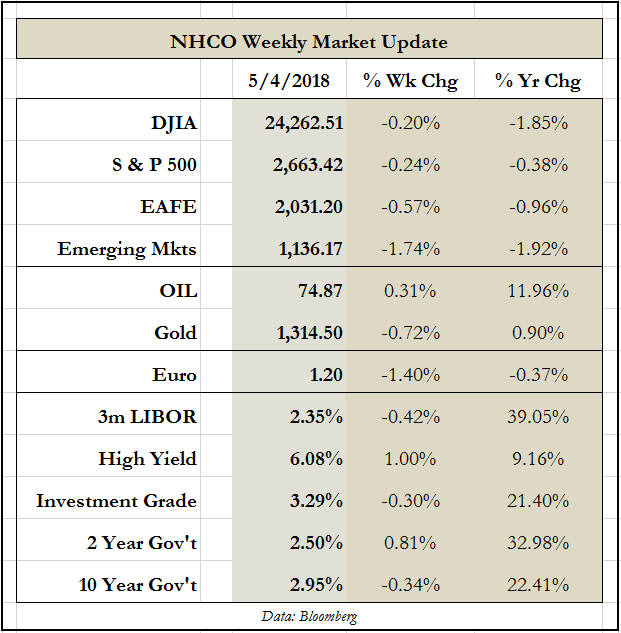 This entry was posted in Education, The Weekly and tagged financial health, financial security on May 7, 2018 by nhoffmanandco.